Combine ingredients for Honey Soy Lime Glaze in a small saucepan over medium high heat. Bring to a simmer for a few minutes, stirring occasionally, and allow the glaze to thicken. Remove from the heat and set aside. Rinse and dry the vegetables. Be sure to thoroughly rinse the bok choy - rinsing under running water can help remove any dirt between the leaves. Slice peppers into 1/2-inch wide strips. Trim the very end of the baby bok choy stem, but don’t remove too much or they will fall apart. Cut each bok choy stalk in half lengthwise, and if you see any residual dirt, rinse and dry them again. In a medium bowl, combine 2 tablespoons lime juice, canola oil, 3 minced garlic cloves, salt, pepper, and lime zest. Whisk together then add the bok choy, coating thoroughly. Set aside. Slice the salmon into portion-sized pieces and place them on the sheet pan (I cut a two-pound side into 6 pieces). Brush thoroughly with the honey soy lime glaze, sprinkle with fresh cracked pepper, and place in the oven for 5 minutes. After 5 minutes, add the sliced peppers to the sheet pan. 3 minutes later, add the marinated bok choy to the pan (or use a separate sheet pan if necessary). 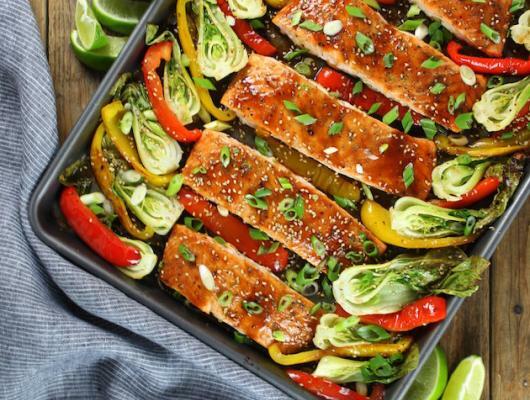 Within 7-8 minutes the salmon should be cooked through and the veggies should de al dente. Remove from oven and brush salmon with more honey soy lime glaze. To add more color to the salmon, and for less crisp veggies switch the oven to broil, and broil for up to 2-3 minutes. Watch the bok choy carefully to make sure they don’t overcook. Serve warm and garnish with sliced green onions, toasted sesame seeds, and lime wedges. 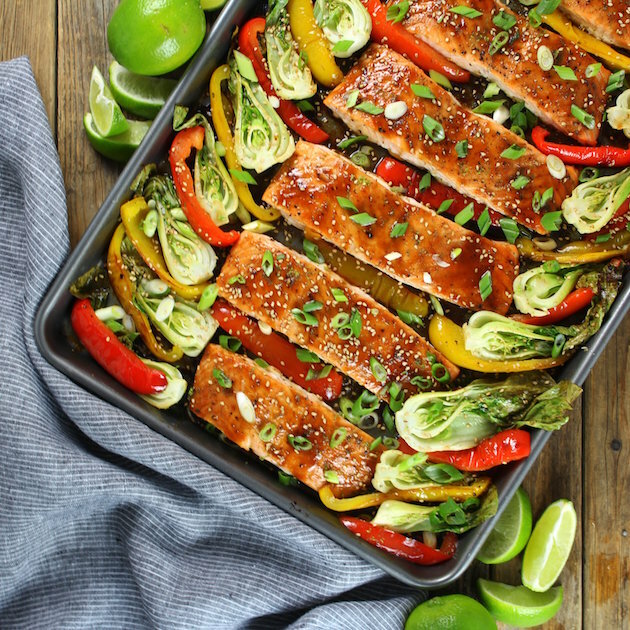 Honey-Lime Roasted Sheet Pan Salmon and Vegetables - an easy, delicious weeknight meal w/healthy ingredients like bell peppers, bok choy, lime & garlic. Check out more of my delicious recipes on my blog!